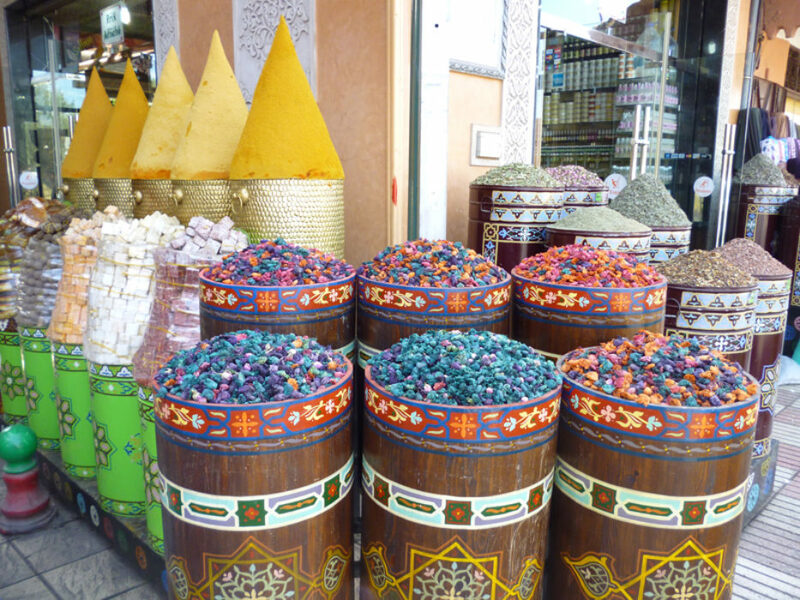 Morocco holds an immediate and enduring fascination, a blend of the exotic and the unfamiliar. Despite years of French and Spanish colonial rule it seems far removed from western Europe, and from civilisation. Of its many famous cities – Fes, the imperial city of the north and widely accepted as the cultural capital of the country, and the more cosmopolitan Casablanca – for me Marrakesh (or ‘Morocco City’, as early foreign travellers called it) has always conjured up the most vivid of images. A city of colour and contrast, this hot, dusty, beating jewel of a city is an evocative place. From the moment we arrived and got in a taxi from the airport I lost any sense of predictability or direction as we dodged between mopeds, vegetable carts and the horse-drawn carriages locally known as Calèches. Unfamiliar sounds filled the air as we passed souks heaving with traders, spread deep in a maze of stalls and stores. Ochre-coloured spices were piled high alongside fabrics and trinkets, while snake charmers, storytellers, street dentists and Berber drummers competed for attention. After dark the atmosphere builds to a frenzy. One glance in the wrong direction and before you know it you'll be buying something you didn't really want – as we soon found out. 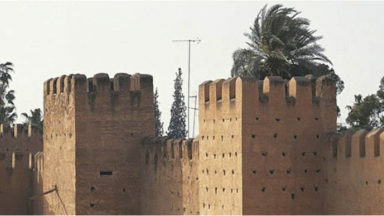 Despite feeling utterly foreign Marrakesh is one of the most accessible 'exotic' destinations for western Europeans, and is served by a number of budget airlines. 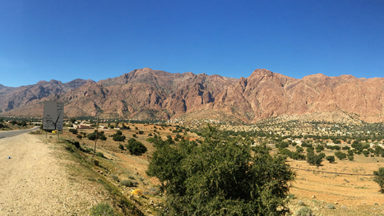 I was surprised to learn that the mystical Atlas Mountains, rising to over 4000 metres and including the highest peak in North Africa, lie a mere 80km to the south of the city. 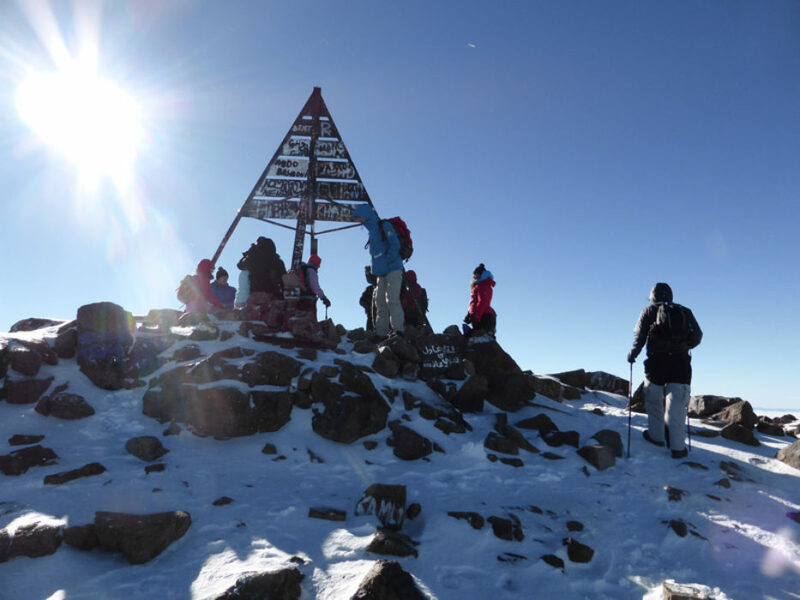 This makes Marrakesh the perfect base for a lightning-fast weekend ascent of Jebel Toubkal, whose summit towers to a mighty 4167m. Driving southwards out of Marraakesh along the Tizi-n-Test road, with the peaks of the Atlas ahead of us, we left the main road at the bazaar town of Asni and began to climb into the foothills of the Atlas, following the picturesque Mizan Valley as far as the trekkers gateway town of Imlil, the start point of our trek at 1740m. Muleteers loaded our luggage on to mules and we enjoyed one more cup of mint tea before setting off. The start of the trail followed winding, tree-lined paths. We dodged descending mules carrying huge loads as we climbed 4km along the valley to Aroumd, the largest village in the Mizan Valley. Built on a huge spur, this is a spectacular place with steep fields of potatoes, onions and various kinds of fruit trees. As we crossed the floodplain shortly after Aroumd the clouds began to roll in and it began to rain. As we walked our guide for the weekend, Houssain, looked up at the sky apprehensively before mentioning that out of the 182 times he had summited this peak, on only three occasions had he encountered bad weather. Typical, I thought, reflecting that only yesterday we had been sitting in warm October sunshine sipping sweet tea in Djemaa al-Fna, Marrakesh's central square, beneath the imposing tower of the Koutoubia Mosque, watching the pulse of the ‘Red City’ (as Marrakesh is also known) and listening to the frequent muezzins, the five times daily call to prayer. 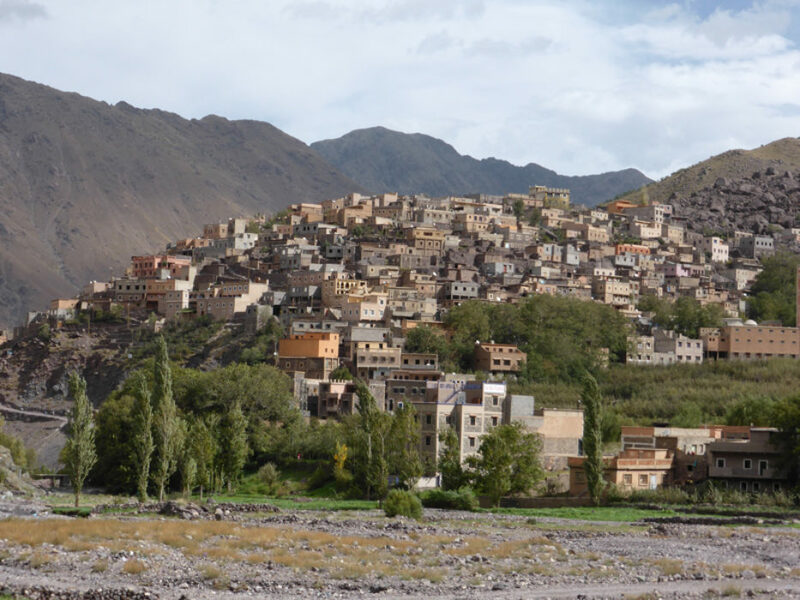 With the rain beginning to fall harder I pulled on my waterproofs as we continued to climb keeping to the left slope, initially following the river, before the path bent away to the tiny settlement and shrine of Sidi Chamharouch, located at 2310m. A huge white-painted boulder marks the spot where, legend has it, a holy man lies entombed. Darkening skies and rocky peaks served as a timely reminder of how quickly the weather can change in the mountains, and after a quick sugar fix we didn't hang around, not wanting to catch a chill. A steep path zig-zagging upwards led us into the Isougouane valley. It was hard going in the wind and driving rain, which slowly turned to sleet and then snow the higher we got. The old Nelter refuge was a truly welcome sight when it appeared out of the mist, and it was an even greater relief to get inside out of the cold and wet. Despite being only 12km from Imlil we’d been walking for nearly 9 hours. Located at 3207m, and surrounded by peaks, the Neltner Refuge is operated by the French Alpine Club and sleeps around 80 people in dormitory-style accommodation. Despite its bunkhouse appearance it does have bathrooms, and the large dining area and lounge with an open fire took on a cosy feel at dinnertime as a tall tagine accompanied by couscous arrived fresh from the Berber kitchen, the fragrant spices momentarily taking us back to Marrakech. I'd given up on any hope of reaching the summit, given the amount of fresh snow that had fallen higher up, but over dinner Houssain explained that we would continue with the plan and see how far we could get the following day. After being shown to our bunks for the night I dozed off, hoping my sodden clothes and boots would dry overnight. Before I knew it alarms were sounding and groups were scrambling to organise kit in a flurry of blurry-eyed activity. 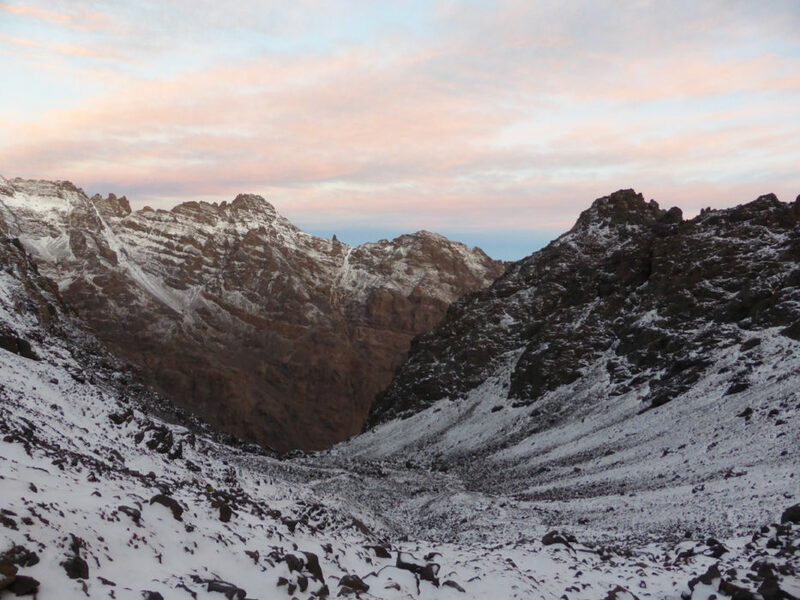 Shortly after 5am we stepped out into the clear, cold, moonlit night and began our assault on Toubkal. 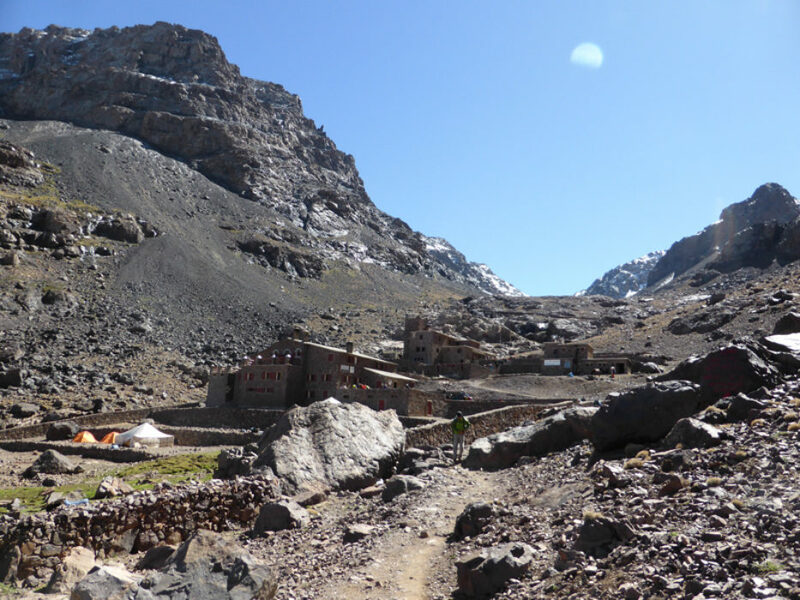 We began by dropping down to cross a stream before climbing steep zig-zags across Toubkal’s innumerable fields of boulders and scree. It was tough going but we were making good progress under the spectacular starlit sky. On reaching our first goal, a corrie about halfway up, we continued as the sky turned pink and the sun slowly rose but the higher we climbed the more snow we encountered. 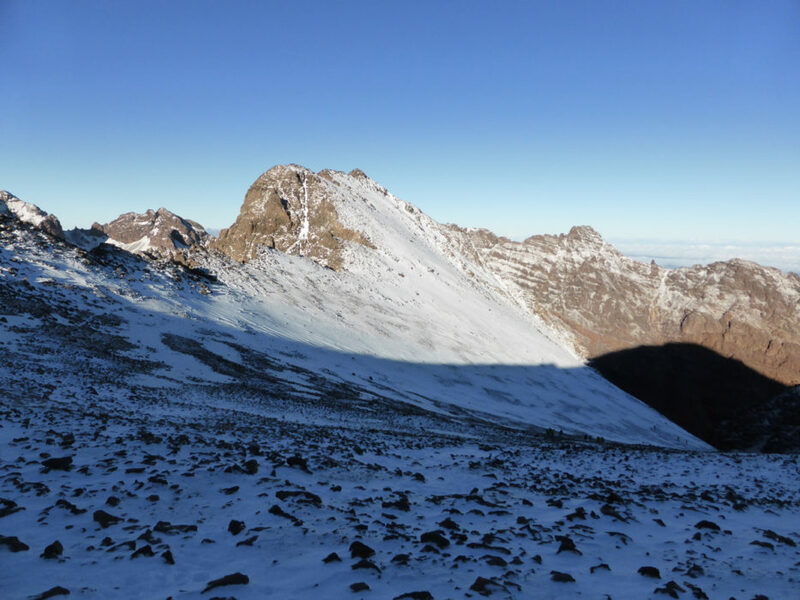 Normally non-technical in nature, the climb was now turning into a serious winter mountaineering undertaking and without crampons I was grateful to have my walking poles as I kicked steps into the snow as we approached Tizi'n'Toubkal, a col at 3940m. 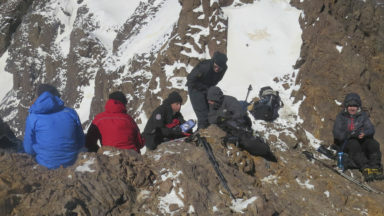 Several of the group were also struggling with the altitude and two or three people had sat down in the snow to regain their bearings. Houssain encouraged us on 100m at a time as we traversed to the left, crossing icy patches and following the serpentine path towards the summit. 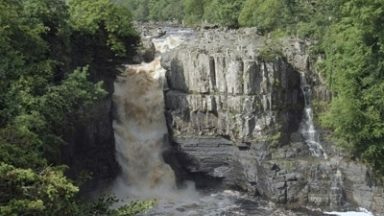 I didn't dare look down, preferring to concentrate on the spectacular views of the surrounding jagged ridges. It wasn't long before I hauled myself on to the summit plateau, five and half hours after leaving the refuge. 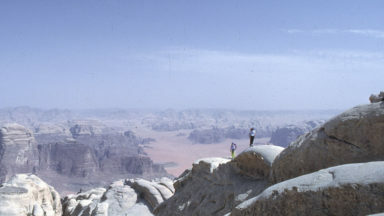 The 4167m summit, which is curiously marked with a metal tripod, is a truly astonishing place, serving up views high above the clouds and across a Mars-like landscape of red dust and rock below. It was brutally windswept and cold as I savoured the moment, enjoying the epic vistas of the Sahara Desert to the east and the Atlantic coast to the west. After snapping a few essential photos we began the descent, which was as brutal as the climb. 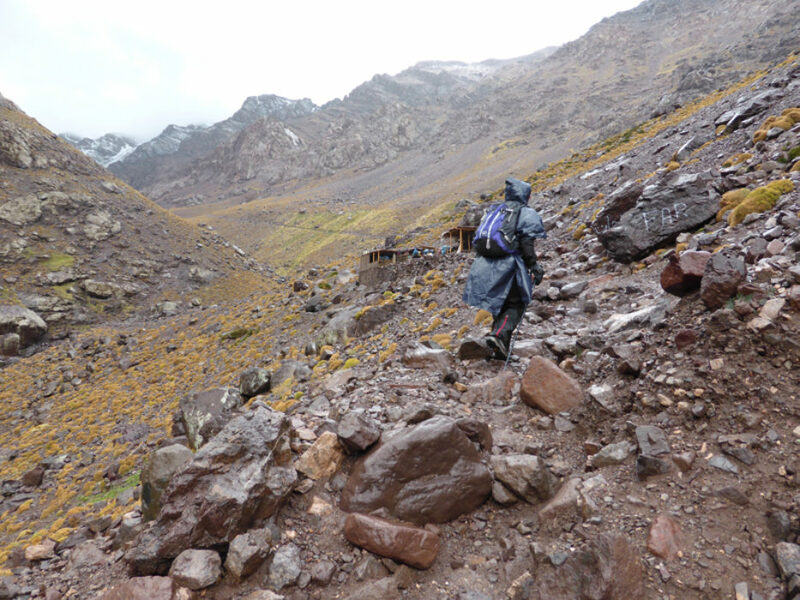 The melting snow really sapped the legs and I slipped and slid long before the lower screes and boulders for which Toubkal is more famous. Arriving back to the Nelter refuge, head throbbing, I was exhausted and couldn't contemplate having to hike back down to Imlil. 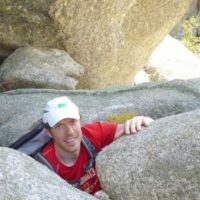 But after a hearty lunch and several mugs of tea I felt rejuvenated, and we began the long trudge back, passing several wayside stalls where it was possible to buy a welcome cool drink in the hot afternoon sun. What a contrast to the wet weather we had experienced the day before! Finally arriving back to Imlil an epic 13 hours after our early morning start we boarded our transport back to Marrakech, where I immediately fell asleep. Returning to the bustle of Marrakech, over our final dinner in a local restaurant, I found it hard to believe that earlier that same day we had been the highest people in Northern Africa, which now felt like a lifetime ago. Despite the tough conditions the weekend proved to be one of the most satisfying big mountain trips I’ve ever been on. In the space of a short walking break in the Lake District I had sampled a truly foreign culture, climbed a 4000m peak in what turned out to be winter conditions and stood on the highest peak in Northern Africa. Not at all bad for a weekend's work.